Our audio tours are designed to help visitors look more closely at works of art both in and out of the museum and see things they may not have otherwise noticed. STQRY is a mobile storytelling smartphone application for visitors to explore, engage, and discover more. Download it before your visit and have immediate (and free) access to the audio tours for Dale Chihuly at Tacoma Art Museum and the Chihuly Glass Walking Tour. You can also access audio tours of past exhibitions like Edvard Munch and the Sea, Art AIDS America, and Photographic Presence and Contemporary Indians: Matika Wilbur’s Project 562. Available with the STQRY App or stream online here. Printed guides are also available at the museum (1701 Pacific Ave, Tacoma, WA 98402). This free tour allows users to learn more about Dale Chihuly’s artwork as they visit Tacoma’s Museum District. The tour features 19 audio stops located throughout the Museum District that provide smartphone users the opportunity to hear a narrator—and even Chihuly himself—talk about the installations at Tacoma Art Museum, Union Station, the Chihuly Bridge of Glass, the University of Washington Tacoma Library, and The Swiss Restaurant & Pub. Learn how the “uglies” became Macchia, how many pieces are in the Seaform Pavilion on the Bridge of Glass, and how eight Venetians found a home at The Swiss Restaurant & Pub. 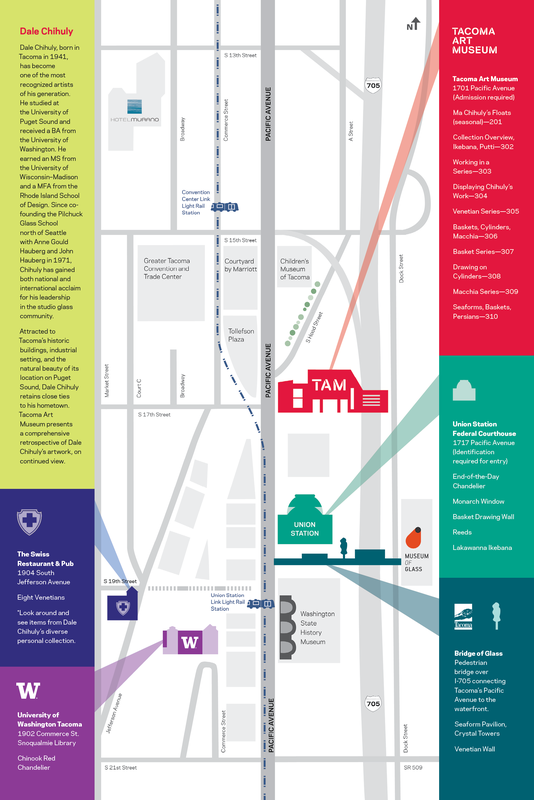 Download a map (PNG) showing every location in Tacoma’s Museum District. You can also listen by using the free STQRY app on your phone, or accessing the web version. If you prefer the personalized touch of a guided tour, Tacoma Art Museum also offers the Chihuly Glass Walking Tour.